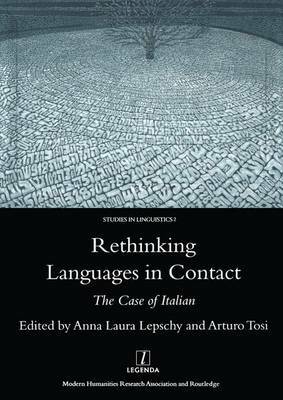 Taking as its theme the interaction between Italian and other languages, and marking the 50th anniversary of the publication of Weinreich's seminal Languages in Contact, this volume provides an up-to-date survey of the role of linguistic and cultural interaction in the process of language change. The range of contributions covers: theoretical issues; different forms of language contact in Medieval and Renaissance Italy; dialect transition and diversity in the North and South of Italy; lexical and morphological borrowings; register and syntactic loans in the Romance area; old and new contact varieties of Italian in the Mediterranean, including Malta and North Africa; and, finally, Italian under pressure from English in EU institutions. The volume is published in memory of Joseph Cremona (1922-2003), and includes a bibliography of his work. Anna Laura Lepschy is Visiting Professor at the Universities of Reading and Toronto, and Emeritus Professor at University College London. Arturo Tosi is Professor of Italian at Royal Holloway, University of London. With the contributions: Peter Matthews - On Re-reading Weinreich's Languages in Contact; Nigel Vincent; Languages in Contact in Medieval Italy; Brian Richardson - Latin and Italian in Contact in Some Renaissance Grammars; Cecilia Robustelli - Latin and Vernacular in Contact in the Sixteenth Century: The Latin Model of Giambullari's Grammar; and, Mair Parry - Markedness, Salience and Language Change: Exploring an Italo-Romance Transition Area. It also includes: John Green - The North-South Axis of Romance: Contact Reinforcing Typology? Martin Maiden - Accommodating Synonymy: How Some Italo-Romance Verbs React to Lexical and Morphological Borrowing; Chris Pountain - Syntactical Borrowing as a Function of Register; Adam Ledgeway - The Dual Complementizer System in Southern Italy: Spirito Greco, Materia Romanza? Rosanna Sornicola - Dialectology and History: The Problem of the Adriatic-Tyrrhenian Dialect Corridor; Alberto Varvaro - The Maghreb Papers in Italian Discovered by Joe Cremona; Joseph Brincat - Languages and Varieties in Use in Malta Today: Maltese, English, Italian, Maltese English and Maltaliano; and, Arturo Tosi - Languages in Contact with and without Speaker Interaction.